1 Pair of Curved Scissors, 10"
Catheter tubes are available in four colors (clear, blue, green or purple) and with either radiopaque or clear nylon buttons. 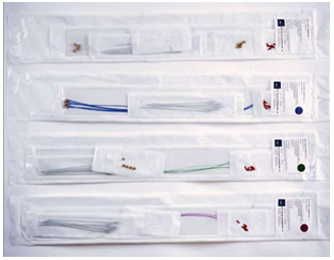 The Brain Implant Kit consists of an outer catheter made of celcon and an inner catheter made of nylon with a nylon filament. The outer catheter has a standard length of 25 cm (other lengths available) with a special obturator and flexible button, closed smoothly on one end. The O.D. of the outer catheter is approximately 0.080" and the I.D. is 0.057". The inner catheter has a standard length of 26 cm (other lengths available) with O.D. of approximately 0.052" and I.D. of 0.038". It is designed for use with standard Iridium-192 and Iodine-125 sources. The filament can be used as spacers and can be heat sealed. 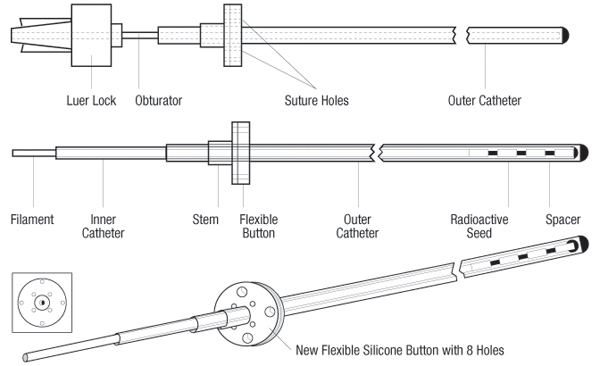 The buttons can be positioned along the outer catheter using the appropriate glue. They have suture holes and the stem can be crimped or heat sealed. Each kit is supplied with 3 buttons: flexible large, flexible small, and stainless steel.